Creature is a new horror novel from Hunter Shea. The monsters live inside of Kate Woodson. Chronic pain and a host of autoimmune diseases have robbed her of a normal, happy life. Her husband Andrew’s surprise of their dream Maine lake cottage for the summer is the gift of a lifetime. It’s beautiful, remote, idyllic, a place to heal. But they are not alone. Something is in the woods, screeching in the darkness, banging on the house, leaving animals for dead. Just like her body, Kate’s cottage becomes her prison. She and Andrew must fight to survive the creature that lurks in the dead of night. Creature was not at all what I was expecting. I assumed there would be non-stop action since people were getting pulled in from the start. I was wrong. What takes place right from the beginning is amazing character development. Creature is actually a very slow burn of a novel, but I absolutely loved it. 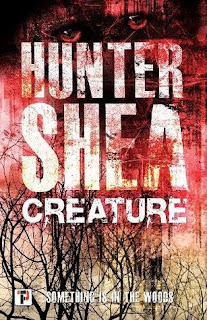 Creature is a personal novel for Hunter Shea, and it shows from beginning to end. The main character Kate suffers from numerous autoimmune diseases. Shea does not shy away from showing you what it is like to live with a battered and failing body nor what it is like to be the spouse and caretaker of a loved one going through medical hell. In Creature, Kate's husband takes a leave of absense from work for the summer so he and Kate can spend the season on a secluded lake in Maine. Unfortunately, Kate and Andrew are not alone. There's a creature that lurks in the woods, and it's been watching Kate and Andrew. Creature is an amazing read, and it may end up as my favorite book published in 2018. I'm glad you liked this one - I loved it as well. Of course, you can imagine I was worried about Buttons the entire time and even tried to get Shea to tell me if the dog would live while reading it but he wouldn't budge! Right? LOL. I think Tracy had to spoil Buttons fate for Emily ahead of time because she was so worried. Well color me intrigued! I love slow burn books and great characters are becoming a must for me. Yes! They are becoming a must for me, too. If you like Hunter Shea, please, please read this one! A "creature feature" type novel with amazing character development? Those are the best kinds of books! And so rare too, because usually with this genre a lot of authors don't really bother with much character exploration. Really interested in checking this one out now. So rare! I hope you check it out. I really want to hear your thoughts on it! Wow that's high praise! I've seen his name around on horror- focused blogs, and this one sounds scary as well as insightful! It is high praise. It's one of the only full five star books I've read this year. I hope it doesn't turn out to be too slow burning! I already bought this and will read it soon I hope. I'm so glad you have this already. I want to hear your thoughts! Wow, this sounds very strong and I feel like there's probably a lot of metaphoric action going on with this story. I feel like it would be too chilling for me to read though! I'm glad you loved it so much. I may have to read this, I've only read one other Hunter Shea book and it was pretty silly 😁 This sounds more like my thing! Tammy! I hope you do read it. Hunter Shea is the only author who has received a 1/10 from me, and now he's one of the few who has received a 10/10. Life is strange. I CANNOT wait to get my hands on a copy of this!! Great review! I still have not read a Hunter Shea novel and really want to. I have heard great things about him! Great review!